In the woods, Maurice becomes lost when a pack of wolves attacks him; he finds his way to a mysterious castle on the edge of the Crossroads and enters. The servants (Lumière, a maître d' turned into a candelabra, Cogsworth, the head of household turned into a clock, Babette, a maid turned into a feather duster that still seems to retain her flirtatious tendencies, and Mrs. Potts, the head of the kitchen turned into a tea pot) welcome him but the castle’s master, a horrid Beast, arrives and orders Maurice to be locked away for trespassing. Back in the village, Gaston meets with the asylum owner Monsieur D’Arque. They plan to lock Maurice away to blackmail Belle into marrying Gaston (“Maison des Lunes”). In the castle, the Beast and Belle attend a lovely dinner and personal ball, where they dance together in the ballroom (“Beauty and the Beast”). After, the Beast (who plans to tell Belle he loves her) asks her if she is happy here, she responds positively but notes that she misses her father. He offers her his Magic Mirror to view him: he is sick and lost in the woods. 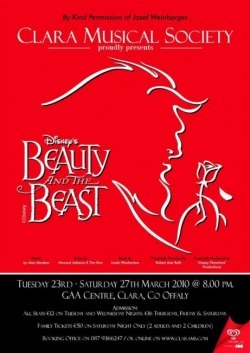 The Beast allows Belle to leave in order to save him; she departs after a tearful goodbye (“If I Can’t Love Her (Reprise)”).